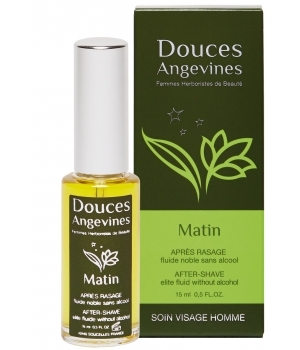 Very gentle and non-oily, it soothes irritations due to shaving. Perfect moisturiser*, the Morning balm provides an immediate feeling of comfort and leaves the skin soft, supple and elastic. It also protects against ageing. Typically masculine, green and woody, it predisposes to lightness, to make the trial of shaving a true delight. 1. Cosmebio Label: ECOCERT controls on nearly all our fluids, certified "ecological and organic"
2. Hand-made in limited editions: 2 to 30 litres maximum per product, per season. 3. Plants hand-picked in our beauty garden and in the wild under strict rules. 5. Manual transformations with gentle manufacturing processes (macerates, concentrations), non-polluting, using natural energies. 6. Alchemical dynamisation of the cosmeto-fluids at every stage (picking, transformation). 7. Guaranteed 100% natural, derived solely from plants. No animals testing at any stage of the manufacturing, for any ingredient. No synthetic preservatives (paraben, phenoxyethanol), no synthetic colouring agent or fragrance. Apply a few drops and make it penetrate with your fingertips, on the slightly moist face and neck, everyday after shaving.